The open road. A two-seat cockpit. A sporty, rear-wheel drive layout. A powerful, thunderous V8 engine. These are all things the tow truck driver experienced as he hauled my new Aston Martin to the dealership on Saturday morning. The #DougCar has already broken down. You’d know this if you followed me on Twitter, because I posted several pictures of the car being loaded on to a flatbed tow truck. And not only did it break down, but it left me stranded at 5th and Market Streets in Philadelphia—one block from Independence Hall, where our founding fathers signed the Declaration of Independence, freeing Americans from the overbearing tentacles of the British. Maybe those guys had the right idea. But before we get into the latest problem—namely, that my car sounded like a tropical bird in distress—let’s go back and cover the issues I was having last week: water leaking into the passenger side floor mat and a check engine light. As it turned out, the water was a simple fix that merely required un-clogging an air conditioning channel. But the check engine light alerted my dealership to a failed thermostat. A seven-hundred and thirty-eight dollar failed thermostat. The result is that my warranty had already paid for 20 percent of itself in the first week. And that brings us to week two. On Saturday afternoon, my friend Mark came over to check out the car and have lunch. This should’ve been a simple occurrence: first, we would drive the car. Then, we would eat pizza. My stomach was excited all morning. An hour later, I was sitting in the passenger seat of his BMW Z4, driving behind a Triple-A tow truck over the Tacony-Palmyra Bridge into New Jersey. There would be no checking out the car. There wouldn’t even be pizza. A few seconds after we left my garage, it became immediately clear something was very wrong. The car was making an almost unbelievable noise; a combination of metal-on-metal clanging and a high-pitched squealing noise in a vocal range traditionally reserved for dying animals and people on American Idol who cry when they aren’t chosen. You can hear the sound in my latest video, because I recorded a clip before the car went on the flatbed. Unfortunately, I was unable to record the sound at higher speeds, when it was really loud, although I have provided a sufficient re-enactment in the video. You’re welcome. Interestingly, the sound seemed to be happening regardless of the car’s speed or direction of travel. It happened when I slowed down. SCREEEEEEECH. It happened when I sped up. SCREEEEECH. It happened when I went backwards, or forwards, or even just turned the steering wheel. And it was clearly coming from the wheel on the front passenger side. SCREEEEEECH. SCREEEEEECH. SCREEEEEEECH. At first, Mark and I assumed it was a rock that had somehow gotten stuck in the brake mechanism – so I drove the car for a few seconds to try and jar it loose. SCREEEEEECH. Sometimes, the sound would go away, only to come back moments later. SCREEEEEEEEECH. Eventually, it was so deafening that I retreated into an alley, parked the car, and called for a tow truck. The noise was so loud that it sounded like the front axle had stopped entirely and the car had become a wheelbarrow someone was attempting to push without first picking it up. Believe it or not, I wasn’t too disappointed that we had to flatbed the car to the dealership, because the screeching sound wasn’t the car’s only issue. You see, I picked up the car on Wednesday, January 6, after they fixed the problem causing the last check engine light. By Thursday, January 7, a new check engine light had already appeared, and I made a new appointment to bring it in a few days later. I just wasn’t expecting to be back at the dealer so soon… especially in the passenger seat of a BMW Z4. Apparently, the tow truck driver had seen my videos. And as I was standing there, looking at my broken new car—now on its second dealer visit in two weeks—all I could think was: I WISH I still had my Skyline. My reliable, trouble-free Skyline that never once sounded like it was trying to birth an alien through its front brake caliper. Although the dealer has not yet solved the car’s latest issues, I’ve already drawn a little conclusion based on my experiences so far. 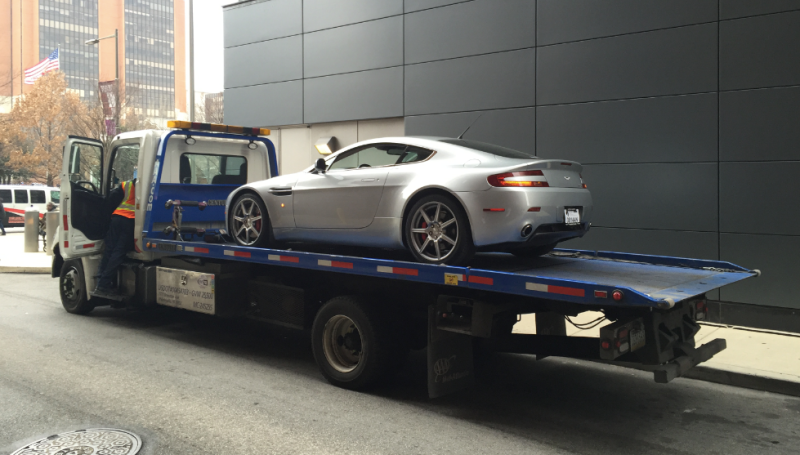 As of today, I have now been home in Philadelphia 14 total days since I bought my Aston Martin. Of those days, the car has been in my garage a mere five of them. Perhaps this is the strategy with Aston’s “unlimited mileage” warranty: the miles are indeed unlimited. But the days you get to actually drive your car… that’s where they get you.